The following guide provides you with a fix that may help you recover a Windows 7 system if sound suddenly stops playing. Something strange happened from one day to the next on a computer system running Windows 7 Professional. The sound would stop playing even though sound worked before, and was configured properly. What this meant was that no sound was audible regardless of the program used to produce it. This included music files, video files, YouTube videos and games, and regardless of the program used. Video players, music players, computer games, and browsers would produce no sound at all anymore on the system. Something was wrong and I had to troubleshoot the issue to find out why sound was not working on the system. The puzzling thing was that I did not make any modifications to the system.No software installation, no changes to sound related settings or anything like that. The Creative X-FI sound card was connected, the volume was set to a moderate level and the devices were enabled. Still no sound in Windows 7. A check in the Sound control on the Control Panel showed the devices that were able to produce sound on the computer system. The default device is the WsAudio_DeviceS(1), and the Creative SB X-Fi Speakers are only set to be the default communications device. 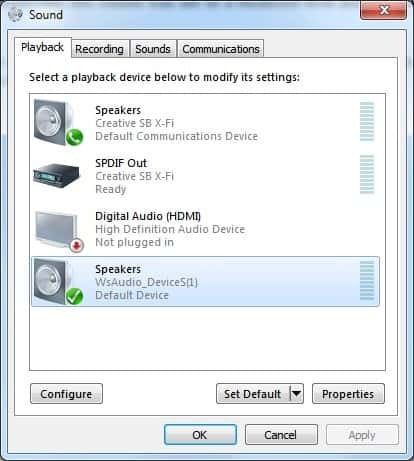 It is possible to change the default device with a right-click on the preferred device for default sound playback and the selection of Set As Default Device from the menu. This turned the sound back on immediately. A good way to test is to play some sound in the background while performing the operation. Later that day the sound device was switched again to WsAudio-DeviceS(1) which was obviously not wanted. It is unclear why the device was switched again. The only viable solution to prevent that was to disable the device that was not needed by right-clicking and selecting Disable in the Sound control panel. This removed the device from the display and prevented Windows 7 from switching the sound output device again. Please note that the same sound control panel is also part of Windows 8.1 and Windows 10. You can use the same process described above to troubleshoot sound issues on those newer versions of Windows as well. If you encounter a situation where sound is no longer audible in Windows, you may want to try the following fix that helped me. Same card, same problem but XP. No idea what changed either. I found that by messing around with the playback devices and selecting/disabling defaults worked fine the first time I had this problem. Now I have been doing the same thing over a period of days and still no sound. I don’t know who’s to blame. Microsoft, Creative, Myself or the manufacturer of my comp. I installed Windows 7 Professional on a Dell E521. LIke everyone else, I have no sound. Been trying a number of fixes, so far nothing works. I had previously Windows XP pro on the same machine, but reformatted the C drive or “zeroed” it, then did a fresh Win 7 Pro install. You think MIcrosoft would be aware of this problem by nw and be offering help for it. From going to their website they are asking $49.00 to fix problems. I went through all kinds of things, reinstalling Java and Flash and finally found one solution that worked. Go into your Control Panel / Hardware and Sound / Device Manager / Sounds and delete your ATI driver. Restart your computer and it will find a proper one for you and everything will work ok again. It worked for me, hopefully it’ll work for you too. Deleting the driver and device worked. The system found the correct driver on a restart and everything worked.Thanks for such a simple solution. and i didn’t see anything that said “ATI Driver” or ATI……. ??? I can hear music when i’m just listening off of my laptop, but when i put my headphones in, all i could hear were instruments and no singing…. so i was thinking that i might be able to fix the solution the same way that you told the other people (delete the ATI Driver)… what do you think? Thank you for your help. The exact same thing happened to me and disabling the ws-audio fixed everything. Thank you so much! Thank you! This worked like a charm. Wow – thanks. It was making me nuts. Turned out to be that I was using an HDMI cable to my monitor, so the default sound device was actually my (speakerless) monitor. Unplug HDMI, plug in VGA cable – I again have sound! I just purchased a new HP Desktop 3500 pro and a ASUS 24″ monitor with speakers. I have no sound and don’t know what to do to get it. Can anyone help me? Thanks. Thanks, this pointed me in the correct direction. I had to right-click the playback screen to show me the disabled devices then I was able to re-enable the proper speakers. Nice one. It was doing my head in. My computer does not even recognize my speakers. They are plugged in correctly and have power. I have a missing driver apparently…WsAudioDevice_383S (1). I don’t want to pay $29.99 through a device updater company. Any ideas out there?